Not fewer than 5,000 residents of Jakana town in Konduga Local Government Area of Borno State were forcefully ejected from their home on Monday night, according to reports. According to an emergency aid worker, dozens of trucks started arriving Bakassi IDP camp at about 11:30pm on Monday bearing people from Jakana although there was no actual number of people in the truck. We had told them that they should surrender the suspects but they refused; also, there is intelligence report that terrorists are planning to attack that axiz. 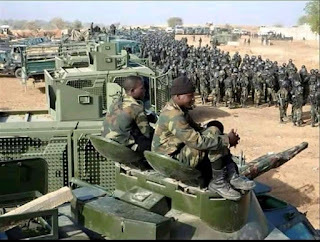 Abdulkadir Ibrahim, Informarion Officer of the northeast zonal office of the National Emergency management Agency (NEMA), said confirmed on Tuesday morning that "residents from jakana town of konduga local Government Area, situated along the Maiduguri Damaturu Highway, have been evacuated to Bakassi IDP Camp in Maiduguri by the military for their safety as a result of ongoing operations to flush out insurgents in the area".